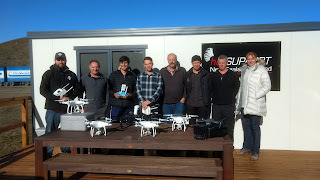 ASMS is returning to Wanaka for a UAS Pilot Certificate course on 1-2 May. This year we'll be based at the Warbirds & Wheel's Museum at Wanaka Airport. This course has been heavily pre-sold, so there are only limited places available. Book now to reserve your place! Photo: Course attendees plus tutor Heather Andrews, Wanaka, August 2017.